Tamil Eelaam has without a doubt turned into an issue that has nothing to do with the Tamil people either in Tamil Nadu or in Sri Lanka and everything to do with India’s strategic interests. Eelaam is nothing but a tool and a white horse to advance India’s strategic interest. It is something the Tamil people of both countries must learn to accept and refuse to fall prey to. Unfortunately, the Tamil representatives in both India and Sri Lanka are in the pockets of India who have been outsourced the task of maintaining the bogus “Eelaam” quest politically which camouflages India’s intentions and actions. India has meticulously turned the Eelaam quest into an opportunity to advance its territorial stakes while ensuring India’s plans remains on track. Sadly, Sri Lanka’s leaders continue to fall prey and refuse to use the strength of the public that detests India in Sri Lanka to deny India’s game plan to permanently create a stake inside Sri Lanka. None of the events in history has happened without a reason and certainly not without a plan. Many of the events in history have staged by politicians to advance their political careers and has little to do with any service to its people. This is true of politicians in all parts of the world. Had their decisions been guided without greed and lust for power the world would not be plagued with endless conflicts and disharmony? The creation of the United Nations was meant to avoid another World War but we have mini-wars taking place in every part of the world and much of the conflicts stem from new concepts and doctrines that have been welcomed inside the chambers of the UN largely influenced by larger more powerful nations that seek to tap into the resources of nations that they have forced into debt as a result of international banking systems choking Third World nations. Had UN stuck to the Westphalian sovereignty much of the problems that exist today would never have sprung into existence? It was the 1648 Peace of Westphalia from which nation-state concept originated. Westphalian sovereignty promotes the right of a sovereign state, it advocates the principle of legal equality between states, in other words no sovereign state possesses legal “high ground” and it advocates the principle of non-intervention of one state in the internal affairs of another. The reason why the 3 basic principles came to be dissolved to usher in the concept of “humanitarian intervention” had much more to do with leaders denying human rights to their citizens and a good look at the history of tragic events would foretell how much of the tragedies were conspired and created by intelligence agents tasked to start rebellions, insurrections and terrorism as seen today. Thus, terrorism is nothing but a commercially lucrative political ploy to capture territories that are economically and geographically advantageous to powerful nations. Westphalian sovereignty has been thrown out and the UN stands accountable for allowing inequality amongst nations and for creating animosities and differences amongst the people of the world. It was the colonial era that breached much of the codes of governance ushering a period of slavery, religious conversions, divide and rule policies and implanting the majority-minority thinking mentality amongst people who had been living peacefully. All countries of the world will naturally have a majority populace and several minorities. It is customary for minorities to use their minority status to bewail shortcomings and blame them on the majority. Sri Lanka’s case is no different. It is in this context that Sinhalese despite being the majority find themselves at odds to understand what Tamils are really being legally and constitutionally denied. Would it suit the Tamil people to go back to times of the British when only they enjoyed missionary English education leading to them securing Government jobs and enjoying better social status than the Sinhalese Buddhists who had to make do with Pirivena Schooling? Why did no one speak of the injustice to the Sinhalese where only Tamils were enjoying a higher status? Whereas the whole world seems to think a policy introduced as “Sinhala Only” in 1952 was the sole reason for the animosity between the Sinhalese and Tamils, how many cared to counter this by asking why the Illankai Tamil Arasu Katchchi party formed in 1949 with the specific objective to create a Tamil Eelaam in Sri Lanka? In 1948 Sri Lanka gained independence and it took less than a year for Tamils to start a quest to divide a small country into two creating a Tamil Eelaam in an area that suited India’s strategic interest. 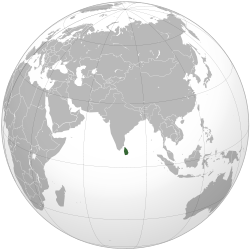 Sri Lanka’s national flag denotes the minorities which even India does not, every public document of the State is in Sinhala and Tamil, Tamil cultural events are given public holidays, all public events are broadcast in Sinhala, Tamil and English, road signs, bus routes, cricket commentaries are also all in Tamil. There were times in recent history where Sri Lanka’s diplomatic service had more Tamil envoys than Sinhalese, several Central Bank governors were Tamils, even the Inspector General of Police had been Tamils, Sri Lanka’s Foreign Minister was also Tamil but was gunned down at his own home by the LTTE, a party claiming to be looking after the interest of Tamils, even Sri Lanka’s Government has Tamil representatives. So in the eyes of the Sinhalese people they cannot see any discrimination apart from that which politicians, the West and India attempt to portray. What makes things more confusing is that realistically it is the Sinhalese who have been the underdogs and the group that has been neglected and if genuinely analyzed the Sinhalese have been the deprived ethnic group and not the minorities. How is it that Colombo the commercial capital is overtaken by Tamils and Muslims and even the wholesale business hub of Pettah is dominated by Tamils and Muslims and not the Sinhalese? Nevertheless, eelaam has become a perfect tool now that the obstacle of Prabakaran and the LTTE is now no more except of course the Tamil Diaspora who again are outsourced the task of keeping alive a fictitious eelaam in order to steer global publicity as a cover up. However, we must add that it was in India that grievances against Brahmin Hindi rule that started a “We Tamil Movement” in Tamil Nadu desiring to separately seek its own autonomy. India categorically ruled out such an initiative and planned a pseudo Eelaam struggle by funding and training terrorist groups in Sri Lanka. With time terrorists end up forgetting instructions from their creators and take their own course such was what happened to the LTTE and led to the assassination of Rajiv Gandhi. India’s plan of using eelaam for its own benefit was such that even the 1991 assassination of Rajiv did little to change its course otherwise LTTE should have been history way back in 1991 as punishment for killing an Indian. If India claims to have chipped in to help Sri Lanka in the final stages of the war in 2009, it was only to claim its stake in post-war to again keep its main plan on track – that plan has nothing to do with Tamils and everything to do with choking the Sinhalese leadership into eventually annexing Sri Lanka to India on the pretext of looking after the welfare of Tamils. The 50,000 houses is nothing other than houses built for the illegal immigrants that have been steadily coming over the years from Tamil Nadu. The teachers, the medical experts, the laborers are all part of this eventual drive since Sri Lankan officials are often gullible to “humanitarian” assistance unaware or not thinking of the larger plans that have been put in place. The Indian missions in Jaffna and Hambantota are just 2 watch towers to look over the welfare of Indians and not Sri Lankan Tamils. The ferry services, the railtracks, the electricity grids are all clues and none of our leaders seem to be aware of what they are walking into by agreeing to Indian offers! So, eelaam has been too perfect a ploy for India to subtly take over Sri Lanka as is currently taking place – their cheap drugs now hitting the pharmacies will in fact put Sri Lankans health at risk and apart from talking drug policies nothing is being done. So India can be quite satisfied of itself – it masterminded a terrorist movement that last 3 decades, it is now using “concern for Tamils” to practically walk over the Sri Lankan Government, it embarrasses Sri Lanka internationally and still for all its red carpet all the way for India – what is happening? What more could India want and given the pace with which Indian companies are now rooted in Sri Lanka we can but ask our leaders are we really a sovereign country as of now? Sri Lanka’s handling of the Tamil issue has been more than tardy and had Sri Lanka’s leaders over the years communicated the real scenario to its people things would certainly have been far different. Instead as politicians, Sri Lanka’s political leaders have enjoyed playing football allowing separatist agendas to surface and resurface taking a handful of administrative hiccups to an international platform that has been artfully choreographed to depict a picture of ethnic discrimination and genocide. Hypocrisy is such that the world speaks about a fictitious unverified number (40,000) massacres totally ignoring how the Sri Lankan armed forces saved close to 300,000 Tamil civilians. Then there are the Tamil representatives belonging to elite social caste and class thinking power of the Tamils lay in their hands only have been advocating a separate land in Sri Lanka and overseas flouting Sri Lanka’s constitution and the 6th amendment and not a single Government or Opposition member of Parliament or any other political party have demanded action against these parties. It is all well to have any political party in a democracy but no political party or individual should go against what is enshrined in the constitution of that country! Had such action been taken at the outset Tamil political parties would have refrained from acting as they have and they would not have been bought over by external forces to champion separatism and devolution amongst the Tamil people by fooling them. Did any of these parties throughout 3 decades plead with the LTTE not to kill their own people, or to ask the LTTE not to kidnap and turn Tamil children into child combatants depriving them of education? It has been well to use Eelaam to make homes in greener pastures claiming discrimination though Tamils themselves know the lies behind these claims nevertheless we have reached a juncture that necessitates Tamils in particular to come forward and nullify the lies. Politicians are the same and will make promises to ensure they remain in power. The Tamils must know that Eelaam is never the end solution to any of their issues irrespective of any Sinhala involvement as is been portrayed – jobs, education, money, livelihoods etc will not be answered by creating a Tamil eelaam – so what is the deal? Had India been concerned about the Sri Lankan Tamils would India not be looking after the Sri Lankan Tamil refugees in Tamil Nadu better – why would they demonstrate and cry foul over the way they are being treated – is this not an eye opener for Sri Lankan Tamils in Sri Lanka as to India’s real intentions. So we are now at a stage where politicians are setting their own agendas totally flouting the sovereignty of Sri Lanka allowing India to choke us into subverting our island nation to be eventually under Indian rule and hegemony. Is this what freedom from LTTE is to equate to? Our foreign policy should remain non-aligned which will ensure that we do not end up like Iraq, Afghanistan, Kosovo, East Timor, Haiti, Sudan and all other nations that have been victims of “humanitarian intervention”. We have had solid friends who have stood by us in times of need closing the doors to them and allowing only India is leading Sri Lanka towards hara kiri of our nation saved by our armed forces and the sacrifices they have made. No country treats the natives of another country that they have “invaded” as equals – people of Sri Lanka must take note. Moreover as custodians of the country and servants of the people who have elected politicians it is not left for them to decide to break up chunks of the country or its resources without the consent of the people. Politicians will always be politicians it is now time for the public to stop being politicians as well. India’s envoy is in Sri Lanka and we can but wonder what India is now demanding and more importantly why we have to give in! Do Top Politicos & Governors Forget to Read & Write Once They Reach High Office? I have read several articles when the Average Citizens try to communicate with the High Office in the Sri Lanka Government, either they receive a “cold shoulder” or “no comment”. Whilst the letters sent by me to President Bill Clinton, HRH Duke of Edinburgh, Premier Tony Blair, President Premadasa whilst they were in office, received a prompt response, typed by a Secretary of course, but signed by the man himself, whilst Premier Edward Heath prompted with a hand-written note. I write this letter after reading an article published in LankaWeb by a patriot who was treated without civil courtesy or human sympathy by several High Officers in Colombo. Most of these “jumped-up” nobodies, reaching a position of prominence, tend to think above their Status, and tend to forget who elected them to that position. I hasten to point-out that even the Governor of Central Bank lacks such common courtesy to respond to a polite business request on Export related subject whilst he travels at the Tax Payers expense on “jaunts-of-no-return”. President Mahinda Rajapaksa has succeeded in his fight against terrorism, largely due to the loyalty, wisdom & professional judgment of Colonel Gothabhaya Rajapaksa. Whatever ex-General Sarath Fonseka might claim as a Commander, the last word was given by the Commander-in-Chief the President, on the advice of the brother. The closeness of the Rajapaksa Foursome has been the success story of Sri Lanka. The fragmented Opposition, at this moment, has no credible alternative, even when the Rajapaksa Regime and its popularity is on the wane. In fact, both Gothabhaya and Basil are the best conduits to reach the upper echelons of the Command Structure, if all other communications fail. Speaking from experience, HE the President and the First Lady have developed a reasonably active Line-of-Communication with the normal people such as I am, a positive way to receive Feedback. I presume, both Gothabhaya & Basil, two persons oozing with empathy, have developed a similar facility. Other Ministers and their “hangers-on” are, presumably (I hope I am wrong), busy looking after their own pot! I still remember, during the Premadasa Regime, when I visited Sri Lanka with several inward-investment projects, the “front men” of the relevant Minister, started giving me hand written gift lists to be arranged either in Colombo or in the foreign country to facilitate the inward-investment. Even foreign-funded-Aid projects had strings attached, required to be “greased-up” and trusted men were sent to donor countries (ie Sweden) to collect the commissions each month to be deposited in Luxenbourg. During the past few weeks I have been trying to contact a government funded institute, in Colombo by email, fax, telephone without any success. At the end, I got a contact of mine to download my email and hand-deliver to the appropriate Minister, and “Bang” I received a response from the Chairman of the institute. If the country wishes to learn something, look at Singapore. Once again Singapore! Yes! From the Prime Minister downwards, Singaporeans are taught to Read & Write, Be Polite, Smile, Respond to Mail or Phone Calls. One missed call may carry that vital revenue generating opportunity. And Sri Lanka possibly misses many such calls. As an additional note: Get every Public & Civil Servant to open a SKYPE account. Its FREE and saves money on outbound calls. Start Reading your mail, please! And an e-mail response costs nothing, except time. 5 Avenue de l’Aviana, 1202 Geneva, Switzerland. With that statement, you have failed us Canadians one more time when commenting on Sri Lanka, as did Foreign Minister John Baird when he performed his Song and Dance at the UN Security Council about Sri Lanka, and former Conservative Foreign Minister Lawrence Cannon who put out a pathetic Press Release after the Tamil Tigers, the most ruthless terrorist group in the world were militarily eliminated after a 27-year long blooding war, on 19 May 2009. He had difficulty to acknowledge the amazing feat when every other western country patted the back of President Mahinda Rajapaksa’s government saying , “Marvellous, well done, chaps, we got lots to learn from you guys how to get rid of terrorists single handed without requesting for even Canadian troops to come and help you all as is being done in Afghanistan!” So the Canadian’s negative policy on Sri Lanka keeps marching on unabated. As a Sri Lankan-Canadian here is the problem that I am grappling with. All you Canadian Sri Lanka watching politicians and Foreign Affairs Sri Lanka watching bureaucrats obviously do not believe in the Cosmic Law of ‘Cause and Effect’ like I do. Perhaps, this is a deliberate effort in case you all paint yourselves into the corner as a bunch of hypocrites. For 13 long Liberal years under the helm of Prime Ministers Jean Chretien and Paul Martin, Canada let the Canadian Tamil Tiger sympathizers collect, mainly by extortion, 2 million dollars a month to stuff the Tamil Tiger war-chest to buy a sophisticated armoury of guns, bullets, land mines, claymore mines, et cetera to go on killing innocent Sri Lankan civilians in scores of hundreds, and taking away their ‘right-to-life’ which had been hijacked for 27 years by Tamil Tigers. And you with a straight ‘We are Holier thou” face, complained to the UNHRC demanding Sri Lanka’s accountability for getting rid single handed of these Tamil Tigers, the most ruthless terrorists in the world. That is a bit pretentious, onerous, vulgar, and disingenuous, isn’t it, Ambassador Golberg? You experienced what terrorism was all about having watched the Talibans in Kandahar going about with their Tamil Tiger copy-cat killings that also killed our Canadian soldiers. Aren’t we Canadians a bunch hypocrites, when on May 6, 2000, Liberal Finance Minister, Paul Martin, and his cabinet colleague, Minister responsible for CIDA, Maria Minna and several Liberal MPs, supported the fund raising event for the Tamil Tigers by attending a $60-a plate dinner in Toronto. And you complain about “Sri Lanka’s accountability”. Ha! What rubbish, and your comment is not worth two prairie straws swaying in the wind in the more sky than land country. Here’s why, Ambassador Golberg. It was in 1994 that Canada allowed a Tamil Tiger sympathizer to cut a cheque from his account in a bank in Vancouver for $7.5 million to buy 50 tonnes of RDX and plastic explosives from a Chemical Factory in the Ukraine. These were the explosives that were used in the truck bomb that brought down the Central Bank Building in Colombo, on January 31, 1996. And it were the same explosive material that were used to bomb the entrance to the Temple of the Buddha’s Tooth Relic in Kandy on 25 January 1998, killing 12 and seriously injuring 13 others. You better believe it, whether you and I like it or not, we both have Sinhala and Muslim blood on our palms together with 34 million other Canadians. And my Conservative Government had the gall and temerity to get you to make a statement saying, “…and countries like Sri Lanka have yet to ensure full accountability in addressing serious human rights violation.” That is being bombastic, cruel, and having a colonial attitude saying that “we are the masters of your destiny, Sri Lanka”. That shows our hypocrisy to its 10th degree. Hmmm…I am not sure of that! I think the reference to Canada and human rights violation in the context of the Quebec students, was as according to the students spokesperson Leo Bureau-Blouin, Bill 78 is the biggest set back to the students fundamental rights. The students marched down Montreal streets and knocking on cauldrons along the sidewalks in defence of Free Speech. It is important to note that the Quebec bar association, many legal experts, unions, opinion leaders and even anti-corruption hero Judge John Gomery, severely criticized Bill 78 for its restrictive laws that impedes on human rights. So which ever way you try to slice the pie and white-wash Canada, the issue of the freedoms of fundamental rights sticks out like a sore thumb. If Sri Lanka had tried this stunt and curb the University student’s freedom of speech, you bet, Canada would have been one of the first countries who would have pounced on Sri Lanka as human rights violators and advocating that “Canada is Holier than Thou”. While the worst student protests in Canadian history took place at Concordia University in Montreal in 1969, when hundreds of students protested against a professor who consistently gave lower marks to black students. They destroyed the computer lab, set fire to the building, rioted in the streets and caused more than $2 million in damage. That the curbs by the Quebec Government on the ongoing protest by the students in Montreal that the UNHRC Commissioner has pointed out as a human rights violation, you bet, will very likely earn a page in Canadian history too like the Concordia incident! Since Sri Lanka is on it way to recovery, rehabilitation and reconciliation having been haemorrhaged for 27 bloody years by a Tamil terrorist war that was aided and abetted by Canada, it is time that Canada jump off Sri Lanka’s back and stop playing the monkey, in the game of “We are Holier than Thou”, because however much we try to pretend, we are just not as bunch of bright eyed goody two-shoes. According to the observers, in the country of “miracles” and “wonders,” the “star” of ambassadors might be “honored” for several reasons: excessive activity and dynamism, unprecedented surge to meddle in the country’s affairs. The above two paragraphs were taken from a news report carried 21 October 2009 in a Lebanese newspaper giving a slight glimpse of some antics of Michele Sisson who was the American ambassador in Beirut. After being dubbed by the influential opposition as the ‘Viceroy of Lebanon’, Ms. Sisson is now heading toward South Asia to be the American ambassador in Sri Lanka. She told the US Senate Foreign Relations Committee confirmation hearing this June 9 that human rights will be the top-most issue in her agenda when she assumes responsibility in Colombo. In the same hearing Ms. Sisson reiterated that for a meaningful reconciliation in Sri Lanka, there should be accountability for the alleged violations of international humanitarian law (IHL) during the final stages of the battle with the separatist Tamil tiger movement. In a previous article this writer explained that when American officials refer to ‘violation of the IHL’ they mean alleged war crimes. (Quote) Sisson’s own words are finally enough to have an idea about the “mission” the “star of ambassadors” perceived she is doing in Lebanon. “The United States believe that the cabinet formation process must be completed as soon as possible according to the Lebanese Constitution and in harmony with the results of the parliamentary elections that took place in June,” Sisson simply said a few days ago after meeting the Prime Minister-Designate, just like other MPs who met him in the framework of consultations. It is appropriate in the light of what Sri Lanka is destine to face on issues such as transparency, accountability and reconciliation among others when Ms. Michele J. Sisson settles in Colombo as the next American ambassador somewhere in August or so this year to cite the Vienna Convention of Diplomatic Relations (VCDR). The Vienna Convention of Diplomatic Relations (VCDR), to which both Sri Lanka and the United States are signatories, sets the guidelines on how diplomats should conduct their relations in the host countries together with other provisions. One of the important provisions of this Convention is on diplomatic immunity. Diplomats are exempted from persecution in the courts of the host countries and other legal obligations that the citizens of that country are subjected to. This immunity is however balanced by responsibilities. Article 41 (1) of VCDR reads: “Without prejudice to the privileges and immunities, it is the duty of all persons enjoying such privileges and immunities to respect the laws and regulations of the receiving states. They have a duty not to interfere in the internal affairs of that country”. Sub-paragraph (2) of Article 41 is equally interesting as it states that diplomatic missions must conduct their relations with the host country either with the Foreign Ministry or through the Foreign Ministry of the receiving state. Lebanon is a religiously diverse country transitioning toward independence and democratic consolidation after a ruinous civil war and the subsequent Syrian and Israeli occupations. The United States and Lebanon have historically enjoyed a good relationship due in part to cultural and religious ties; the democratic character of the state; a large, Lebanese-American community in the United States; and the pro-western orientation of Lebanon, particularly during the cold war. institutions of the state, limiting the influence of Iran, Syria, and others in Lebanon’s political process, and countering threats from Hezbollah and other militant groups in Lebanon. Following the June 2009 parliamentary elections in Lebanon Hezbollah emerged as the powerful political entity next to Mr. Hariri’s, the prime minister’s, March-14 political movement to share power in the country. Following Syrian withdrawal from Lebanon in 2005 and the war between Israel and Hezbollah in the summer of 2006, the Bush Administration requested and Congress appropriated a significant increase in U.S. assistance to Lebanon. Since 2006, U.S. assistance to Lebanon has topped $1 billion total over three years, including for the first time U.S. security assistance for the Lebanese Armed Forces (LAF) and Internal Security Forces (ISF) of Lebanon. seats to March 8’s 57 seats, maintaining its slim majority in parliament. The March 14 coalition and March 8 movement are the two main political entities in Lebanon. It was during the period of the 2009 election that Michele Sisson was American ambassador in Beirut. And, it was during this time following the election political factions were struggling to form a stable government when Ambassador Sisson got into the middle of this ‘struggle’, according to Lebanese observers and activists here in the United States and in Beirut, to have total control of Lebanon’s political chess board to suit American foreign policy objectives. Every nation has its own foreign policy objectives and the Asian Tribune has no quarrel over that. This is a disclosure of how Ambassador Sisson ‘performed her diplomatic duties’ at the behest of her bosses in Washington. And to inform the Sri Lankan state in which she will be this fall to represent the United States. When Feltman labeled the US backed March 14 group as the “pro-independence” bloc, while highlighting March 8’s association with Hezbollah, Syria and Iran as the most serious danger to Lebanon and the Region before the US House of Representative committee it became the core policy of the state department. Ambassador Michele Sisson made her political maneuvering in Lebanon based on this policy that Mr. Feltman spelled out before the US Congress. The American ambassador to Beirut Michele Sisson did not act alone in taking sides in Lebanon’s politics and interfering in the internal affairs in that country. She was aware of the state department policy plank toward Lebanon, and therefore had a free hand in meddling in the internal affairs, endeavoring to influence the outcome of the June 7, 2009 elections and her subsequent role in the formation of the government following the election. Ambassador Michele Sisson and USAID/Lebanon Mission Director Denise Herbal announced 11 December 2008 that the U.S. embassy has launched a six million dollar humanitarian assistance program “to help 21 villages adjacent to the northern Palestinian refugee camp of Nahr al-Bared who were affected by the war”.” ( Nahr al-Bared is the camp near Tripoli/Akkar that was destroyed during 12 weeks of fighting between salafist Fateh al-Islam and the Lebanese Army during the summer of 2007 and where serious reconstruction was delayed partly because donors pledges were not been honored). The American Embassy did not explain to some Lebanese who were astonished by this widely perceived interference and electoral ploy how these 21 villages were themselves affected—since most of the villages were far removed from any fighting. Also unexplained, according to Lebanese observers, is the coincidence that the 21 selected villages just happen to be those where US allied candidates (of the March-14 movement headed by Hariri) are facing possible defeat at the polls. The Lebanese political observers interpreted this as ‘quick cash payouts’. A reporters’ question: “What about Nahr al Bared, where they lost everything and desperately need help?” was ignored by the American embassy. The Palestine Chronicle reported: Inquires to the Embassy were answered as is oft stated; “The Government of the United States of America respects the sovereignty and independence of Lebanon, does not interfere in its internal affairs, and will accept the results of the coming election”. This was clearly manifested in a classified diplomatic cable that was dispatched to Washington under Ambassador Sisson’s signature disclosed by WikiLeaks. The diplomatic cable was written 19 February 2009 following the visit by US Senator and Foreign Relations Committee Chairman John Kerry during that week to Beirut. Mr. Kerry is a powerful and influential foreign policy advocate for the Obama administration. The classified diplomatic cable was very clear that the U.S. had predetermined to back Saad Harriri’s March 14 coalition over Hezballah-led March 8 movement at the forthcoming June 2009 parliamentary elections. Ambassador Sisson had the free hand to meddle in the election and the subsequent formation of the cabinet and government. (Begin Quote) Saad Hariri, along with his advisors Nader Hariri, Ghattas Khoury, and Ghazi Youssef, told visiting U.S. Senator John Kerry and the Ambassador that the most important thing for Lebanon was to hold the parliamentary elections as scheduled on June 7. Hariri, confident after a well-attended and successful rally on February 14 to mark the fourth anniversary of the assassination of his father, former PM Rafik Hariri (reftel), said that if the elections were held today, his March 14 coalition would win the majority. He believed Hizballah’s March 8 alliance was becoming “worried” and might attempt any tactic to delay the elections. One could see a chain working; State Department officials, Obama White House, Senate Foreign Relations Committee and American Ambassador to Beirut Michele Sisson interfering in the internal affairs of another country to fulfill foreign policy objectives of the United States. Similarly, Michele Sisson as the American ambassador in Sri Lanka, under current circumstances this South Asian nation is facing today, will have a free hand to influence domestic affairs taking into consideration the pressure the State Department is currently exerting on ‘accountability, transparency, international humanitarian law and reconciliation’. This is how Ambassador Sisson engaged in domestic affairs of Lebanon during the run-up to the June 7, 2009 parliamentary election and thereafter her close association with the composition of the cabinet and the formation of the government. October 2009 media reports, comments and observations were very clear as to how Ambassador Michele Sisson acted as the ‘viceroy’ of Lebanon. During the cabinet crisis, Sisson appeared to be one of the most “influential” figures. At the beginning, she made all possible efforts to prevent the formation of the cabinet under the 15-10-5 formula or at least to prevent the participation of Hezbollah in the cabinet. To achieve this goal, she made visits to top officials but couldn’t do anything. Following PM-designate Saad Hariri’s re-appointment, Sisson changed her “strategy.” This time, she decided to visit those who “dream” of a cabinet seat and urge them to obstruct the cabinet formation process until they receive a seat within the cabinet. One media outlet commented: “Indeed, ambassadors are usually accredited to a foreign sovereign or government, or to an international organization, to serve as the official representative of their country as well as to build diplomatic, economic and cultural relations with the country. (Begin Text) Once again, it’s the US interference in Lebanon that imposes itself through… the US ambassador in the country, Michele Sisson! Indeed, in a country that has transformed the ambassadors into “stars” who can tour around the various politicians and express their opinions over all internal and external issues, no one has the “force” to just criticize the US ambassador. On November 9, 2009, Prime Minister-designate Saad Hariri announced that consensus had been reached and that a cabinet had been formed. The announcement followed five months of tense negotiations between Hariri and his March 14 coalition and the March 8 opposition. The debate centered on the minority March 8 coalition’s desire to retain the veto power (one-third plus one or 11 of the 30 cabinet seats) that it was granted in the Doha Agreement of May 2008. The March14 coalition was committed to a cabinet that reflects the election outcome, and views the Doha Agreement as a temporary power-sharing arrangement that addressed a specific crisis. The March 8 coalition, on the other hand, viewed the Doha Agreement as a revision of the Taif Accord, which established the current power-sharing arrangement following the civil war. (The Doha Agreement was a negotiated resolution of 18 months of sectarian violence that preceded Hezbollah’s May 2008 siege of Beirut. In the agreement, the March 8 coalition was granted a minority veto in the cabinet (one-third plus one seats). The consensus cabinet was made up of 15 ministers appointed by the majority March 14 coalition, 10 ministers appointed by the March 8 opposition, and 5 ministers appointed by President Michel Suleiman. This formula differs from the previous cabinet, which provided the March 8 coalition with 11 (one-third plus one) of the 30 ministerial positions and an effective veto over cabinet decisions. The March 8 coalition did retain the telecommunications portfolio, but the Labor Ministry, which was headed by a Hezbollah member in the previous cabinet, went to the March 14 coalition. In this cabinet formation Hezbollah was given two ministry positions, the Ministries of Agriculture and Administrative Reform. Some observers have argued that March 8 still holds an unofficial veto in the new cabinet even though it only has 10 seats. The Shiite Minister of State Adnan Hussein, appointed by President Suleiman, reportedly has long-standing ties with Hezbollah and is presumed to be Hezbollah’s swing vote on crucial issues. During the cabinet formation and the establishment of the government that widespread allegation was leveled against the American ambassador Michele Sisson interfering in the internal process of Lebanon’s affairs. Such sentiments serve as both a reality-check and a wake-up call to every Sri Lankan citizen, as the country moves on from a phase of post-war to post-conflict. It is beyond dispute that Sri Lanka’s three decade conflict was externalized due to a combination of factors – ranging from the presence of an active expatriate community abroad; the involvement of foreign facilitators in the peace process; the presence of foreign peacekeeping forces in 1987, to the greatest diplomatic challenge that Sri Lanka has faced since independence – the country being placed on the agenda of the United Nations Security Council in a bid to halt in its tracks the military campaign to defeat the LTTE. Consequent to the above and other developments, by the end of the war, Sri Lanka was placed within significant cynosure of the international radar. Such international attention has spilled over into the country’s post-war phase as well, but this time taking on new proportions and new meaning. That said, as my previous articles have called for a state-led national reconciliation agenda, so must the process of foreign policy formulation be state-led, inviting the public to participate in the process, and keeping the process open and transparent. There can be no room for ‘strategic ambiguity’, a phrase used by Barack Obama in his 2008 election speeches when he asserted that the public have a right to know through election manifestos of candidates what foreign policy courses will be taken by each candidate, informing voter decisions. Conversely, citizens have a correlated duty to participate, inform and shape the foreign policy discourse and decisions of their country. It is therefore essential that we have institutions that can help in this task. The Cabinet, the Ministry of External Affairs, Parliament especially its Consultative Committee on External Affairs, the career professional diplomats, the media, lobby groups including Chambers of Commerce, professional bodies, civil society, academics and public opinion are among the available foreign policy formulating mechanisms in Sri Lanka. They should ideally be coordinated and used optimally to develop a bipartisan foreign policy. Institutions set up specially for diplomatic training, international studies, provision of policy support and impetus in strategic thinking , namely the Bandaranaike Centre for International Studies, the Bandaranaike International Diplomatic Training Institute and the Lakshman Kadirgamar Institute of International Relations and Strategic Studies, are well-placed to play a catalytic role in such an endeavour. As the former British Prime Minister, Palmerston, speaking of 19th century British foreign policy famously said – “We have no eternal allies and no permanent enemies. Our interests are eternal, and those interests it is our duty to follow” – following our national interests will be the prudent, genuine, and not to mention, the safest course to chart in pursuing a foreign policy – diplomatic honeymoons on the one hand, and unbridled engagements on the other will not be sustainable; over reliance on allies and the defensive criticism of enemies will not take us very far: The victories may be imminent just as much as they will be temporary. As it currently stands, Sri Lanka faces a number of challenges in its foreign relations. Six key challenges need to be addressed with priority. Distinction needs to be drawn between, on the one hand, voluntary membership of world bodies such as the United Nations, voluntary ratification of international treaties and conventions, participation in international mechanisms, and hence being subject to its rules of procedure, obligations of implementation and reporting that come with it, and on the other hand an encroachment of a nation’s sovereignty and territorial integrity that are not as a result of a nation’s undertaking. The true test of our sovereignty will be to follow the nation’s interest, assume strong national positions and communicate such effectively to the local and international communities – this will be the testament to the courage and strength of the nation’s belief in itself and loyalty to its people. We must understand that the opportunity to justify our plans, policies and decisions, to be transparent in our decisions, both nationally and internationally is an exercise of sovereignty, and not an encroachment of it. We live in an age of globalization and unprecedented connectivity that is characteristic of the twenty first century, permeating all aspects of governance including foreign and international relations. The islander’s mentality unfortunately will not work in the realm of international relations and foreign policy. In an inter-dependent world the only way of maintaining sovereignty is not through hostility but through constructive engagement. Sovereignty, in our times, is a relative concept, whether we like it or not. Accordingly, sovereignty in this era can only be maintained to the extent we learn to live in inter-dependence and not in hostility. The impact that the members of the heterogeneous expatriate community have on the politics and electoral campaigns of host governments must be given serious consideration in our foreign policy discourse. The best way to deal with it is to address the rights of minorities locally, both systematically and genuinely. Rights of minorities need to be coupled with assurances for the possibility of peaceful return and life in the country. This is once again illustrative of how domestic policy and foreign policy are inextricably linked. The fostering and maintenance of credibility of national positions should be the underlying objective of the conduct of our foreign relations. This will necessarily require, in keeping with best practice, that there should be one interlocutor between the State and international community. The internal consensus will not only prevent confusion and contradiction but also help maintain credibility and reveal the strength of the establishment – this will be the true test of exercising sovereignty in the conduct of our foreign affairs. Currently, most of the country’s bilateral and multilateral engagements are haunted by a spectre of reconciliation and human rights concerns. We must remember that human rights and inter-communal harmony are not alien to our country, the values of which are enshrined in our shared history, cultures and legal frameworks. We need to capitalize and draw on these strengths to forge a robust system of governance, rule of law and justice mechanisms that will be able to function with independence and credibility : hence, despite every allegation made, so will we have the availability of structures and norms to deal with such allegations domestically. In this regard, the implementation of the outcomes of the two national processes, namely the Lessons Learnt and Reconciliation Commission and the National Human Rights Action Plan will demonstrate that home-grown mechanisms can credibly provide solutions, while improve our foreign relations and prospects. Here once again is a demonstration of the link between domestic and foreign policy. Due to the conflict, we were largely inward looking, preoccupied with internal considerations and taking up defensive positions in human rights and other international fora. With the end of the war, there is now a need to broaden our areas of engagement into areas – such as trade, investment, science, environment, human and arms trafficking, terrorism, regional cooperation – which will reflect, as we have in the past, a deep interest in larger issues. With a shift to the post-war phase, an identification of priorities, a policy of engagement even with those not well disposed must be pursued to find common ground. In the final analysis, it is the consolidation of peace, freedom, democracy and the rule of law domestically that will translate into the ability for us to project our nation as sovereign and credible in the international domain – the link between the protection of our national interests and international positioning cannot be clearer. The on-going demands for implementation of the recommendations of the LLRC remind me of an article of mine, In search of a Peace Package, published on 12 August 2008, in the Groundviews (Ethnic Confrontation and National Integration in Sri Lanka: Some Marginal Comments, Stamford Lake, P. 36). I made the following comments in the said article. 1. “Now that the government appears to be fighting the war to a finish, it behoves concerned members of our civil society to put their heads together to evolve an optimum Peace Package that could win over as many contenders as possible in our ethnic dispute. 2. But it would appear on hindsight that we have only been going round and round the mulberry bush with the problem, for two main reasons. We never had a clear policy on the modalities of resolution. The second reason which is essentially the cause of the first, is that our leaders never had the wisdom, the sensitivity and the courage to handle the problem with statesmanship. In the alternative, they were exploiting the dispute for their own survival in power. 3. The intelligentsia has a duty to engage themselves in the search for a consensus to the vexed problem of our ethnic conflict, if the Tamils are not to be left at a dead-end at the end of the fight. 4. At the going rate of state procrastination, the international community is very likely to become the final arbiters of the dispute, as has already happened in other theatres of ethnic conflict, sometimes to the detriment of the intended ‘beneficiary’. No self-respecting nation could be happy about such an intervention. The best way to prevent such humiliation is for opinion leaders on both sides to engage themselves in a brave and open debate on the maximum mutually acceptable Peace Package”. The international community did intervene with the appointment of a Panel of Experts (POE), on accountability, by the UNSG. The POE made very serious allegations against Sri Lanka, perhaps the worst of which was contained in the following extract of their report. “137. In the limited surveys that have been carried out in the aftermath of the conflict, the percentage of people reporting dead relatives is high. A number of credible sources have estimated that there could have been as many as 40,000 civilian deaths. Two years after the end of the war, there is still no reliable figure for civilian deaths, but multiple sources of information indicate that a range of up to 40,000 civilian deaths cannot be ruled out at this stage. Only a proper investigation can lead to the identification of all of the victims and to the formulation of an accurate figure for the total number of civilian deaths”. “The oncoming Census presents an ideal opportunity to investigate another allegation contained in Darusman. That is the assumption that around 40,000 might have been killed in the final confrontation. Now that the displaced have been settled in their original habitats, the Census documentation for the war affected areas can ascertain bereavements and injury suffered by the relevant families including the causes there for. In cases entire families have been wiped out, the Gramasevaka Officer may be asked to collate the best information available in consultation with the neighbours. Happily the Census has been used to take a house to house count of the war casualties and the Defence Secretary, Gotabhaya Rajapaksa (GR), has confirmed at his recent interview with Charles Haviland of BBC News that a recent government census, given little publicity, suggested some 7,400 northern Sri Lankans were killed during the last months as a result of the fighting. GR had said the census-takers had visited ‘family after family’ and taken the names of all those who died and that the enumerators were 100% Tamil. This figure is an 81.5 reduction of the Darusman estimate claimed to have been based on a ‘number of credible … multiple sources of information’. The final count exposes the bias of the sources of information and the selectivity and the gullibility of some world class investigators. This on-the-spot survey should be far more reliable than long-distance statistical projections by sentimental experts. GR has added that ‘this 7,000-odd number includes the combatants as well’. He has admitted that there might have been “certain” civilian casualties but ‘not in the numbers’ quoted. It is also likely that the ascertained figure included collateral deaths in the battlefield, exempted by international humanitarian law, if they had not been intentionally or recklessly caused. That number would further reduce the Darusman guesstimate. If there were proven violations of the laws of war GR has said, “… then we can punish, no problem, but you have to prove that”. My own belief is that the onus of proof here rests with the Government. Even if the law was otherwise, it would be wise for the Government to undertake that responsibility. Much effort and expense may have gone into the house to house survey but if the Government wants to clinch the issue it should go the extra mile into the causes of the established deaths. That would involve a police investigation, no doubt a tough assignment, but if the cases of deaths are ascertained and action initiated against the guilty on both sides before the next year’s meeting of the UNHRC, the most serious item against Sri Lanka in its agenda would be reduced to a dead letter. It is important that police investigations are made in association with the enumerators who discovered the deaths and the relevant gramasevaka officers and that proper records are maintained. That done, the Government is left with two more issues to face at the UNHRC next year. The first of them covers what the JVP claims to be ready for execution without further ado. It includes resettlement, rehabilitation and equal rights for the minorities. There is no objection from any side to these steps and they can be implemented straightaway. Their implementation would result in immediate relief to those distressed by the war while the grant of such relief must facilitate the path of the long term reforms. The Government has so far failed to convince the concerned public that meaningful positive steps are being taken to solve the problems discovered by the LLRC. Although it is claimed that much is being done to implement the LLRC recommendations the public are in the dark about what exactly is being done. There is a communication gap. A conspicuous Supervisory Committee (SC), appointed to oversee implementation as recommended by the LLRC itself, should remove a lot of doubts and disbelief and present the effort in a new light to the public. That body has to be appointed by the President himself, if it is to be taken seriously, and it should include persons of the highest distinction and integrity. As evidenced by those appointed to the LLRC, the President has a knack of choosing the right people for the right job. He would be wise to reactivate that knack in appointing the SC as well. It has been reported that the President had already appointed a SC of officials headed by his Secretary, Lalith Weeratunga (LW). There is public confidence in the ability and the integrity of LW but the fact that he is the Secretary of the President casts a shadow over him in a scenario in which the President is blamed for soft peddling the issue, presumably with his disenchantment with the proposal to reactivate the Seventeenth Amendment (17A). Besides people have no faith in bureaucratic committees held in camera. Their disbelief was reconfirmed by the failure of such a committee appointed to handle the interim recommendations of the LLRC. What is called for is a replica of the LLRC as the SC. Such a plausible body should have a magic effect on turning the tables on the President’s critics. The responsibility of the SC would be to phase out implementation pragmatically and work on a time schedule, with continuing disclosure. If the SC completes its assignment within a year, we would have much less to explain to the UNHRC next year. “It is possible that some parties would boycott the Committee for ulterior motives. Abstaining has always been a favourite weapon of sabotage among our political parties. But the Government should have the courage to ignore any party that does not have the guts to fight their case before a properly constituted forum. Armed with a Peace Package filtered through (Parliament), the President should feel confident to act on it decisively. The international community which appears to be closing in on our ethnic conflict, is unlikely to turn a Nelsonian eye on a Hamlet-like approach to the Package. In the ultimate analysis, it is the determination and statesmanship with which the ethnic issue is handled that would decide whether Mahinda Rajapaksa or his challenger, Veluppillai Pirapaharan would live longer in history”. It is necessary to understand the dilemma the Government has got into after the publication of the LLRC Report. The Report appears to have become a vicar’s egg for the Government, the bad part being the recommendations on revival of 17A and consequent measures. The very thought of reverting to 17A would be anathema to a Government that sought to entrench its power through the Eighteenth Amendment under the glow of victory. The disturbing delay in going ahead with the other reforms appears to stem from this precondition. It is Utopian to expect a reversion to 17A at this point of time though the latent impact of its abrogation on the voting public is likely to overbalance its gains at the next Presidential Election. Besides reviving 17A is a substantive constitutional issue that cannot be tagged on collaterally to the implementation of a report. Tying up that deadweight with the demand for implementation of the other recommendations of the LLRC can only result in a stalemate that would nullify all that the Commission has achieved. Half a loaf is always better than no loaf. The other half may have to depend on external pressure, the next election or a revival of ethnic hostilities that appear to be raising its ugly head already. Oh, what a sweet little darling of a chap this man Sampanthan is! Let’s all stop whatever we are doing at the moment and rush to embrace him and shower him with kisses or any other gestures to show our adulation. Fall at his feet, if that is what you are used to. For Samapanthan, it is the ignorant translator who inserted the words for a separate nation to Tamils to the ITAK constitution. Let’s join Sampanthan to get hold of the ignoramus and to whip him: the translator is the one who made the innocent Sampanthan a detestable figure in the political scene for millions of Sri Lanka lovers. Sampanthan has never said anything that could mean that he was talking of a separate nation for the Tamils. The foolish Sinhalese – there is the age-old saying, Sinhalaya modaya, kevun kanta yodaya (an amateurish translation of which would mean, the Sinhalese are fools: all that they are masters at is eating kevun, the traditional Sinhalese oil cake) – all this time believed that Sampanthan was advocating a separate identity for the Tamils, away from the rest of the Sri Lankans. There were also those Sinhalese and other anti-separatists who read the speech that Sampanthan gave at the Batticaloa ITAK Convention on 26 May – by the way, they all had been thinking all this time that ITAK was the acronym derived from Ilankai Thamil Arasu which Katchi which when translated meant Ilankai Tamil Nation Party or Ilankai Tamil Kingdom Party. How foolish all these poor idiots have been, and what would have been the situation if there was some grey matter beneath their thick skulls! And, when Sampanthan said, “The Ilankai Thamil Arasu Katchi was created by S.J.V. Chelvanayagam, the father of Tamil Nation” obviously he, in his innocence, did not know that Sri Lanka cannot have two nations, the Sri Lankan and the Tamil. The media had reported Sampanthan as saying, “the Tamil United Liberation Front, of which our party was a member, took the historical decision to establish the separate government of Tamil Eelam in 1976”. The poor media people had got it all wrong. How could Sampanthan ever have let such treasonous words escape through his lips? And, most importantly, when Sampanthan said at the May 26 event, “the sovereignty of the Tamil people is based on a political structure outside that of a unitary government, in a united Sri Lanka in which Tamil people have all the powers of government needed”, the imbecile Sinhalese and everyone else like them thought that he was talking of a separate nation for the Tamils: for their understanding was that unitary and united were terms that had critically different meanings. At least now the rest of Sri Lanka knows who really was behind the mischief that has triggered lawsuits by political groups that value the unitary state of Sri Lanka: leave the poor Sampanthan alone, but take the translator to courts. Let us all help Sampanthan to get rid of the translator first. The LTTE leader certainly had fool proof ways of dealing with those who disagreed with him: Sapmanthan of course has no idea who or what the LTTE is or was. Now that Sampanthan has convinced everyone that he is a true-blooded Sri Lankan, all Sri Lankans will be able to live happily ever after.